TACO Outrigger Kits provide great value, and convenience. Buy the complete kit and save! 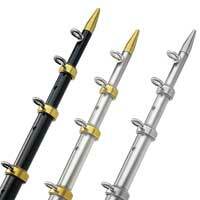 TACO’s complete Sport Fishing kits make it simple to make your boat outrigger ready today. If your boat came "Outrigger Ready", with TACO’s patent pending Outrigger mounting plate, you can bolt on the Grand Slam or Sport Slam top mounts in just minutes. If your boat didn’t come "Outrigger Ready", TACO offers Sport Fishing kits with our new Clamp On Mounting Plate which allows you to add the bolt on top mounts with no down time for your boat. For easy mounting of Tele-Outriggers to your boat deck, the Striker Base kit comes complete with everything you need to quickly mount to the gunnels of your boat.